The name of my domain here is far from accidental. 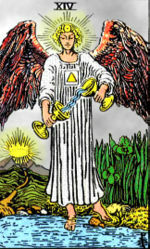 It derives from the Major Arcana Tarot Card ‘Temperance’. The card has many symbolisms, I’ll paste in a few here. You can give Wikipedia a read also. Some Jungians say that Temperance represents the unconscious, which can guide us, they contend, to a deeper understanding of ourselves, and maybe even a meaningful life. The one foot on the land, the other in the water, represents the unification of the external and internal, conscious and unconscious, realms. Under these approaches, when Temperance appears, it is a warning or invitation to be prepared for a confrontation with the deepest questions. Who we are. Who we apparently are. Who we think we are. Who we will become. Magic does exist… just open your mind and your eyes… and try to realize your own creation of the World. Voila !